Secret of the Stones Slots | Claim £250 + 30 FREE Spins! Secret of the Stones slots will transport you to Stonehenge for an ancient and mystical adventure! Spin the reels full of beautiful Celtic symbols and Win amazing prizes! 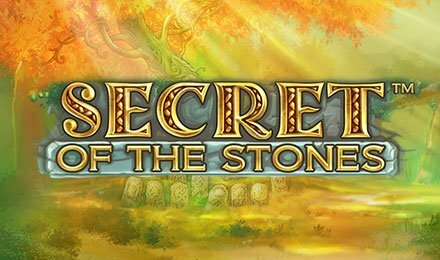 Head to ancient Stonehenge and play Secret of the Stones, a 25 payline slot filled with gorgeous Celtic style graphics. Roam with the ancient Druids and experience magical wins and thrilling gameplay! The Tree of Life symbol is the Scatter and can activate the Free Spins Bonus when you land at least 3 on the reels. In this interactive bonus round you get 10 Free Spins plus the chance to pick stones that reveal additional bonus perks! You can get even more Free Spins, Extra Wilds, Multiplied payouts, and Wild Reels!